Published: May 15, 2017 · Modified: Apr 12, 2019 · By Jen Sobjack · This post may contain affiliate links. 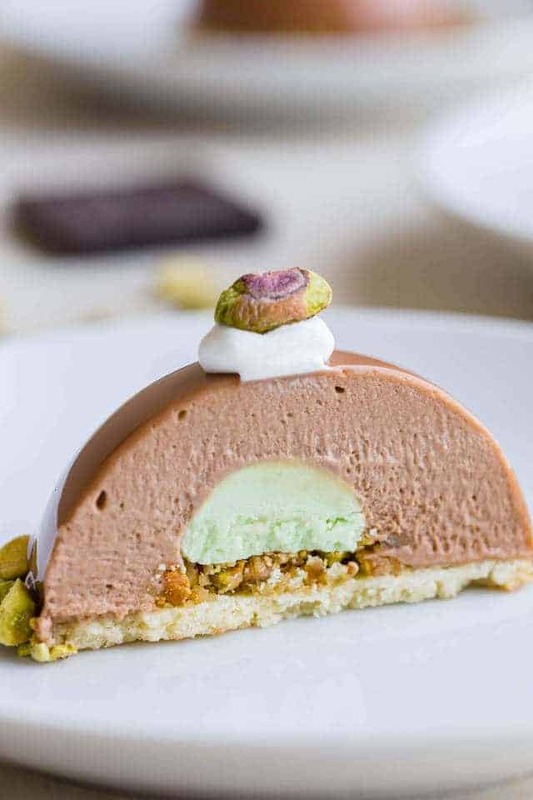 This Chocolate Pistachio Dome with Almond and Pistachio Nougatine is inspired by the elegant Chocolate Journeys dessert served onboard Princess Cruises. It features a creamy chocolate mousse dome filled with pistachio crème mousseline. The dome sits on a vanilla sable with a layer of almond pistachio nougatine in between. A mirror glaze is poured over the top of each dome for an exquisite presentation. This post was inspired & sponsored by Princess Cruises. All opinions expressed are my own. If you’ve been following along, you know I recently partnered with Princess Cruises to cruise through the Panama Canal aboard the Coral Princess. I’ve been sharing my experience along with some of my favorite recipes inspired by the trip. 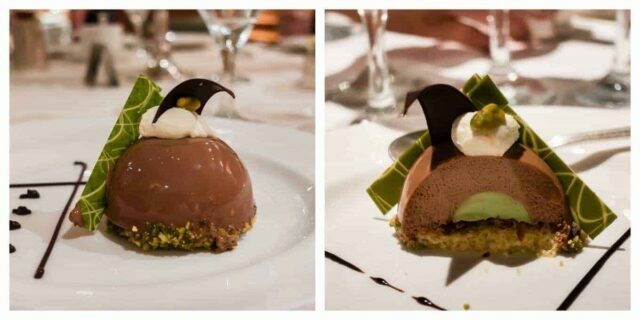 Two nights we were served a Chocolate Pistachio Dome with Almond and Pistachio Nougatine for dessert. It’s part of the exclusive Chocolate Journeys program on all Princess Cruises’ ships. Each dessert is handcrafted by the famous chocolatier, Norman Love. Today’s recipe is dedicated to our lovely host, Sara! She absolutely loves the pistachio dome and couldn’t wait for us all to try it. After one taste, I completely understood her passion for this indulgent treat. The recipe has several steps but don’t let all the steps scare you. They’re really not complicated. Plus, each step is thorough so you can approach the recipe with confidence. Plan ahead when making these chocolate domes! I recommend making all the components of the recipe a day in advance. The pastry cream for the mousseline needs to be cold before mixing in the butter. Then, the final product needs to be piped into molds and frozen for about an hour to set. While the mousseline is chilling in the freezer you should begin working on the vanilla sables. Once the dough for the sables has been mixed, roll it out to a ¼ inch thickness between two sheets of parchment paper. The rolled dough also needs to be chilled before cutting out the cookies. I put it in the freezer for 1 hour to firm up. Then, I proceed with cutting and baking the vanilla sables. While the sables cool, make the almond pistachio nougatine. There will some leftover nougatine once the chocolate pistachio domes are assembled. You can use it garnish the domes or save it and use it in vanilla ice cream! By now the sables should be cool and the pistachio crème mousseline should be firm. It’s time to make the chocolate mousse domes. Once the mousse is prepared, divide it among twelve 3-ounce dome molds. Use the back of a spoon to level the mousse inside the molds and pop them in the freezer for about 20 minutes. You want the mousse to be firm enough to support the weight of the filling but it shouldn’t be so firm, it’s hardened. Once the filling has set slightly, you can begin assembling the domes. 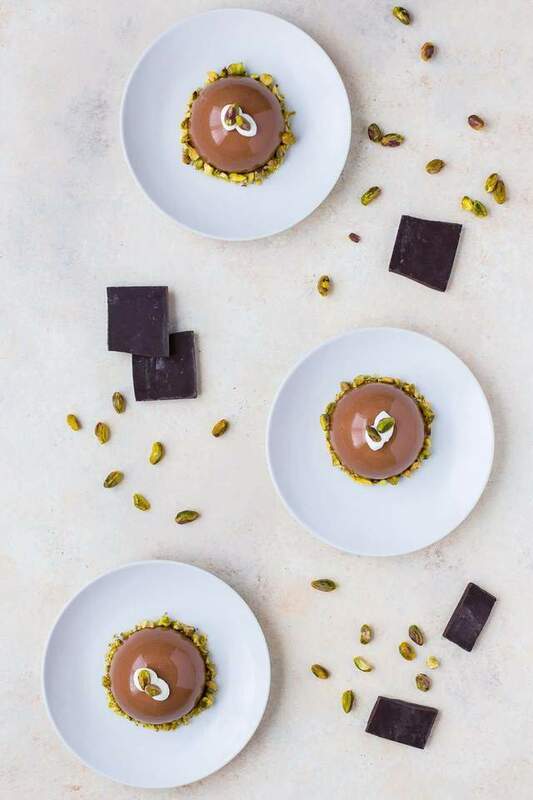 Press one semicircle of pistachio crème mousseline into the centers of each chocolate mousse dome. Press it in just until the base of the mousseline is flush with the base of the chocolate dome. Next, sprinkle about one teaspoon of almond pistachio nougatine over the center and top it with a vanilla sable. The sable should sit snug just inside the mold. Press it gently so it’s touching the mousse. Put the domes back into the freezer to set. This where I stop for the day. I let the domes freeze overnight then add the glaze the next day. I don’t like the texture of the mirror glaze after it has sat in the refrigerator for too long so I glaze the domes just before I’m ready to serve them. Once the glaze is made, it needs to cool before you pour it over the domes. Transfer it to a medium bowl set over ice. Stir it frequently until it cools to 75°F. Strain the glaze through a fine-mesh sieve into a large pitcher or measuring cup with a pour spout. This will make it easier to pour over the domes. Unmold the domes and set them on a wire rack over a large rimmed baking pan. Pour the glaze over the frozen domes. You can make more than one pass if you desire a thicker glaze. The glaze will set to a soft gel-like texture. Transfer the domes to individual serving plates and garnish with whipped cream, leftover nougatine, or chopped pistachios. For the crème mousseline, I used a semicircle silicone mold with cavities about .95 inches in diameter. Each semicircle holds around one teaspoon of filling. You’ll have enough pistachio crème mousseline to fill 24 chocolate pistachio domes. Since the recipe makes only 12 domes, you can freeze the remaining 12 semicircles of crème mousseline and use them at a later date. For the chocolate mousse domes, I used these half circle silicone molds. Each one holds about three ounces. You’ll also need a 1 and ½ inch round cookie cutter. This is the perfect size so the cookies will fit flush with the base of the domes. If you want to have your own Chocolate Journeys experience, whip up a Chocolate Pistachio Dome! You may also want to try Strawberry Panna Cotta, Chocolate Raspberry Cupcakes, Jamaican Jerk Chicken from Lemons for Lulu, and Nutella Donuts from Dinners, Dishes and Desserts. If you’d like to learn more about cruising the Panama Canal, take a look at Cruise Tips for Introverts, Staying Fit on Vacation by Lemons for Lulu, Exploring the Historic City of Cartagena by Postcards to Seattle. 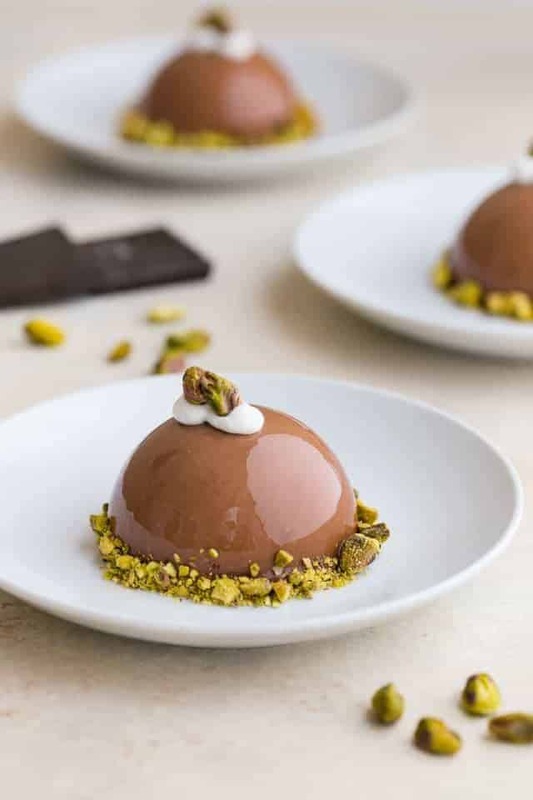 This Chocolate Pistachio Dome with Almond and Pistachio Nougatine is inspired by the elegant Chocolate Journeys desserts served onboard Princess Cruises. It features creamy chocolate mousse dome filled with pistachio crème mousseline. The dome sits on a vanilla sable with a layer of almond pistachio nougatine in between. A mirror glaze is poured over the tops of each dome for an exquisite presentation. This recipe is time-consuming and requires a day of prep before the domes can be fully assembled but the effort is so worth it! Heat the milk and vanilla over medium heat just until it begins to boil. Meanwhile, mix the sugar, egg yolk, and flour together to form a smooth paste. Slowly pour the milk into the paste while whisking continuously. Return the mixture to the pot and cook over medium-low heat, whisking continuously, until thickened enough to heavily coat the back of a spoon. Remove from heat and strain through a fine mesh sieve. Cover with plastic, making sure the plastic is touching the surface to prevent a skin from forming. Refrigerate until set, about 2 hours. With an electric mixer, beat the chilled pastry cream and butter together until smooth. Add the almond extract and a couple drops of green food coloring. Beat until well combined. Pipe the mousseline into 24 .95-inch dome molds. Place in the freezer to set. Beat the butter, both sugars, and salt with an electric mixer on medium speed until smooth. Beat in the egg yolk and vanilla. Add the flour and gently mix on low until well combined. Turn the dough out onto the counter and shape it into a disk. Gently roll the dough into a 1/4 inch thickness between 2 pieces of parchment paper. Slide the parchment paper with dough in between onto a baking sheet and freeze for at least 1 hour. Preheat the oven to 350°F. Cut out the dough with a 1 and 1/2 inch round cookie cutter. You need 12 circles of dough. Bake until dry to the touch, about 8-10 minutes. Cool completely. In a medium pot, melt the butter and corn syrup over medium heat. Stir in the confectioners’ sugar and pectin. Cook until the mixture reaches a full boil. Stir in the pistachios and almonds. Spread the mixture onto a parchment lined baking sheet and bake for 10-15 minutes, until golden brown. Cool completely. Process in a food processor until finely ground. Whip 1 cup of heavy cream to soft peaks. Bring the milk and remaining cream to just to a boil over medium heat. Meanwhile, beat the sugar and egg yolks until smooth. Slowly pour the hot milk into the egg yolk mixture while whisking continuously. Return the mixture to the pot and cook over medium-low heat, while whisking, until thick enough to coat the back of a spoon. Strain through a fine mesh sieve over the chocolate. Mix until chocolate is fully melted. Gently fold in the whipped cream until fully incorporated. Pipe the mousse into 3-ounce dome molds. Use the back of a spoon to level the mousse inside the molds. Place in the freezer for 20 minutes. 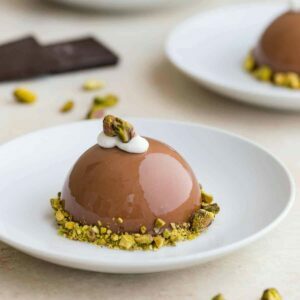 Unmold the pistachio creme mousseline and press one into each chocolate mousse dome. Press it until the base of the pistachio creme is flush with the base of the chocolate mousse. Sprinkle 1/2 to 1 teaspoon of almond pistachio nougatine over the pistachio creme mousseline. Place one vanilla sable over the base of the dome so it sits flush with the mold. Press it gently to make sure it’s in contact with the chocolate mousse. Freeze for at least 2 hours or overnight. Combine 1/4 cup water and gelatin in a small bowl. Stir until well mixed. Let sit for 5 minutes. Heat the remaining water, sugar, and sweetened condensed milk in a small saucepan over medium heat just until it begins to boil. Turn off the heat. Stir in the vanilla and gelatin until fully dissolved. Pour over the chocolate and let it sit for 5 minutes until chocolate is fully melted. Using an immersion blender, blend until very smooth. Take care not to introduce too many air bubbles. Transfer the glaze to a medium bowl set over ice. Stir frequently until the mixture cools to 75°F, about 10 minutes. Strain the chocolate glaze through a fine-mesh sieve into a large pitcher or measuring cup with a pour spout. Unmold the assembled chocolate domes and arrange them on a wire rack set over a large baking pan. Pour the glaze evenly over each dome. Place the baking sheet with domes in the refrigerator for 15 minutes. Using a spatula, gently lift the dome off the wire rack and set it on a dessert plate. Press finely ground pistachios or leftover nougatine around the base of the dome. Top with whipped cream and whole pistachios. Domes are best served shortly after glazing. The glaze will turn gummy if left in the refrigerator for more than 30 minutes. *I haven’t found a good pistachio extract. The ones I’ve tried taste like almond extract. You’re welcome to try the one linked in the ingredients or simply use pure almond extract. The pistachio creme mousseline yields enough for 24 chocolate pistachio domes. I couldn’t reduce the pastry cream more than I did without the risk of burning it during the cooking process. Once the mousseline has been frozen into molds you can transfer the leftovers to a zip-top freezer bag and freeze them for up to 1 month. Use them the next time you make this recipe. There will also be leftover almond pistachio nougatine. Use it to garnish the domes or save it and sprinkle it over vanilla ice cream. Store it in a zip-top freezer bag in the freezer for up to 2 months.